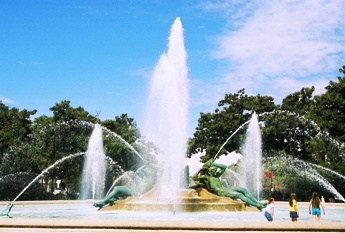 Logan Square is another of Penn's five squares that are part of the original design of the city. As with other squares, Logan was once used as a burial ground as well as a pasture. Logan Square was also the square used for public executions, and a gallows stood on this spot until 1823. In the center of the square is the beautiful Swann Memorial Fountain. 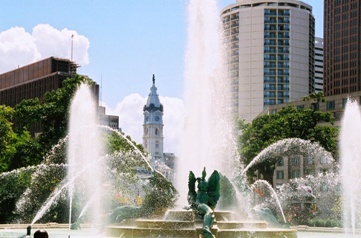 The fountain is named after the founder of the Philadelphia Fountain Society, Dr. Wilson Cary Swann. The fountain, also known as The Fountain of the Three Rivers, is the work of Wilson Eyre, Jr., and sculptor Alexander Stirling Calder. The central geyser in the fountain pushes water more than 50 feet into the air. The fountain abounds with sculpture: three bronze Native Americans, a young girl, swans, turtles and frogs. The fountain was completed in 1924. The most famous use of Logan Square was in 1979, when Pope John Paul II drew 150,000 people when he celebrated Mass from an enormous platform over the fountain.